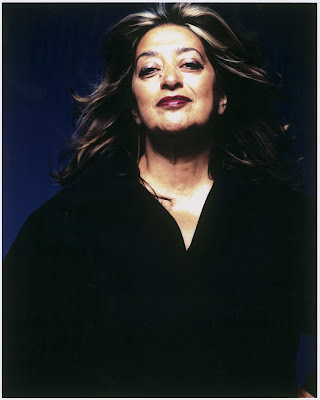 Zaha Hadid, the architect, is profiled by Stephen Bayley in today's Observer. I once was involved in quite a public contretemps with her. A few years ago, she was speaking in the grandiose setting of the Royal Geographical Society, near the Royal Albert Hall. After about an hour of slide after slide of odd shaped buildings (some of them admittedly beautiful), I was first to ask her a question. She had spoken of a social vision in her work; I wanted her to say more about this, as all I could see was formalism - computer-generated shapes and an absence of right-angles or recognisable facades. You know better than to criticize a guru at a speaking engagement where she was invited, I'm sure. Where are your manners, young man? I thought you were British. BTW, did you ever find out what her issues with the white man are? Jeremy, I was at that talk years ago. I thought she was extremely rude. Some of us had issues with her claims, so we were glad you spoke up, but I guess she couldn't allow you to finish your question lest others see through her and start asking her even more difficult questions. I really went off her for a while after that. She is such a prima donna anyway. .. well done jeremy, I am not a fan of her work generally, detest use of student labour, and abhor the lack of a social dimension in her work.please please do it again. BTW Mr RK of OMA/AMO is at the TATE Modern this monday evening. Whoa. Your heart must be strong. You kept speaking after that? I'm sure that would have cut a lot of people to the quick. What is her issue with 'oyibos'? I have heard that she is very racist. I go to a predominantly black school and have been toying with the idea of attending AA in england for my masters. A female alumni from my school once worked with her and said she can be quite a witch with a capital b and she definitely does not like black people. if from what u r saying, she also does not like white people, then who does she like. She is given women in design a bad name men, and yet they keep heaping accolades at her feet. All I can say is Bravo! The kind of ethos so called 'signature' architects spew on us is simply infuriating.We are continuously assaulted by the visuals deemed to be comprehensible only by the initiated and are being brushed aside if we attempt to critically inquire about what is the actual message behind them. 'Post-modern icons' like Hadid,RK and Liebzkind and Gehry among a few, create little more than living monuments to the rule of capital. Koolhaas said as much in a lecture at UCLA in March. Just check out the latest collaboration they intend to construct in Dubai and you will shudder at the wastefulness, total disregard for the environment and whimsical gestures they make. For Rem Koolhaas to term his proposed concrete 50 storeys high spinning skyscraper as an example of sustainable architecture is just an insult to intelligence. One among many. Not just Hadid, but Koolhaas and Gehry have been confronted at their lectures about their inconsistent rhetoric only to brush the questions off as the work of detractors. I blame the fawning masses for elevating them to the level of infallible deities, that we shouldn't dare to question. I'm sure history will judge them more harshly than the constructivists and modernists of the past.